Irish Forums Message Discussion :: Five Minutes of Heaven, Irish movie about the troubles. Irish Forums :: The Irish Message Forums- Irish Films- Five Minutes of Heaven, Irish movie about the troubles. Irish Films Discussion: Five Minutes of Heaven, Irish movie about the troubles. I have been wanting to watch this movie ever since I first read about it here on these Irish Forums. Thank you to Damo for making this possible. Five Minutes of Heaven is a Irish made movie about the troubles. 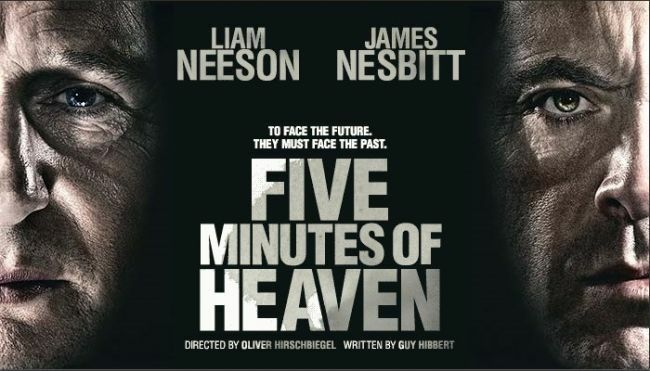 James Nesbitt and Liam Neeson star in award winning director Oliver Hirschbiegel�s Five Minutes of Heaven, a unique one off drama that explores aspects of the north of Ireland�s troubled past and the challenges the future holds in coming to terms with it. Five Minutes of Heaven recently won two awards at Sundance - one of America�s biggest film festivals including the World Cinema Directing Award and World Cinema Screenwriting Award. The story begins in 1975 when 17-year-old Alistair Little, a member of the UVF murdered a 19-year-old Catholic, Jim Griffin, in Lurgan. He was arrested two weeks later, along with three others involved in the shooting, and convicted. Jim�s murder was witnessed by his 11-year-old brother, Joe Griffin. Five Minutes of Heaven, directed by Hirschbiegel (Downfall) and written by Guy Hibbert (Omagh) is a fiction inspired by real people. Working closely with both men, screenwriter Guy Hibbert creates a unique and compelling film that moves from a powerful re-enactment of these tragic events to a fictional interpretation of what might happen should these two men ever come face to face. The film explores the impact of the legacy of violence on both men. You need to post in this Irish Forums topic to see the full article. Irish people optimistic satisfied survey. Apathetic Irish. Call for unity of the Irish people.